Date of issue: November 12, 2001. The territory of Kazakhstan and Middle Asia in VIII-III centuries B.C. was settled by Sak tribes named as Asian Scythians in the ancient sources. Lofty and original culture of these tribes is known mainly due to archeological finds made during excavations of the ancient burial places. Reconstruction of the dress of Altyn Adam (Golden Man) (III c. b. c.) is exhibited in the museums now. The burial of Altyn Adam was discovered in 1969 in region Yssyk. In the central part of the right side of the coin on the smooth surface an element of head-dress – protoms of winged horses with goat horns, constituted frontal emblem of kulah, is shown. 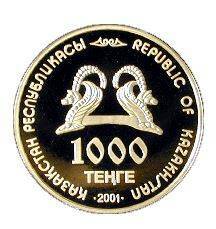 In the lower part two line legend “1000 TENGE” indicates face value of the coin, the figure “2001” indicating the year of coinage. 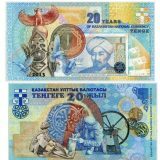 Along the circumference there are two legends “REPUBLIC OF KAZAKHSTAN”. 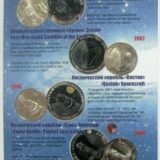 In the upper part of the coin these legends are divided by image of decorative figured plates of kulah ornament. In the back side of the coin on the smooth surface there are a model of “Golden Man” and some gold ornaments. Left side represents enlarged metal plates as the main ornament of caftan and boots. Right side along the circumference represents metal plates in the form of leopard. 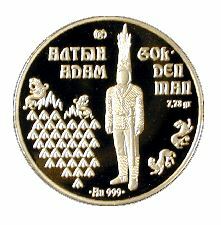 Trade mark of Kazakhstan Mint and the name of coin in Kazakh (ALTYN ADAM) and in English (GOLDEN MAN) are placed in the upper part. 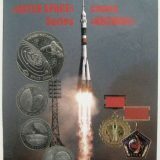 A legend “7.78 gr.” indicates coin weight. 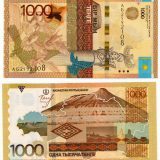 In the downside legend “Au 999” indicates production metal and standard of coinage. Images and legends are relief.